Earlier in the year the three brothers who completed last years noviciate made their First Profession into the Dominican Order. The brothers who spend a year in our Noviciate in Cork have now made their First Profession to continue with the next step in their life as a Dominican. 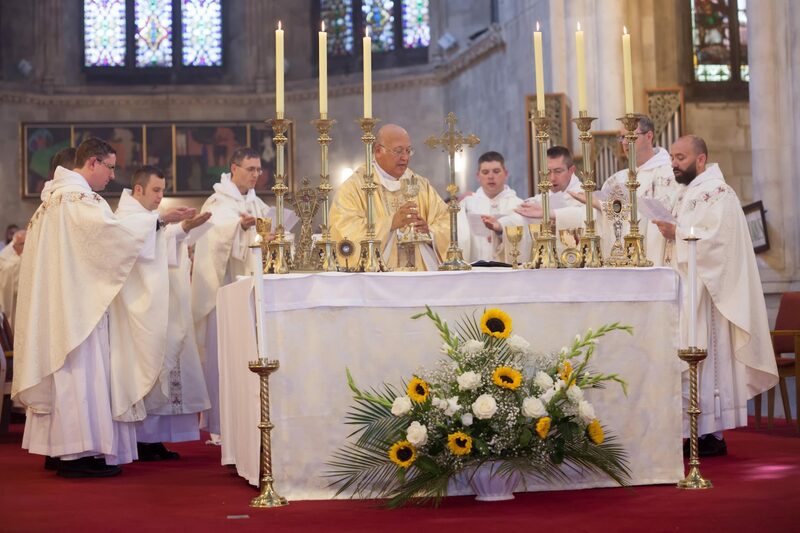 In our Studium, which is in St. Saviour’s priory in Dublin, they are now studying philosophy and theology for the next few years and, with the help of God, to subsequently be ordained priest. Please have a look at the short video of this joyful event. The photos of this event can be found here. 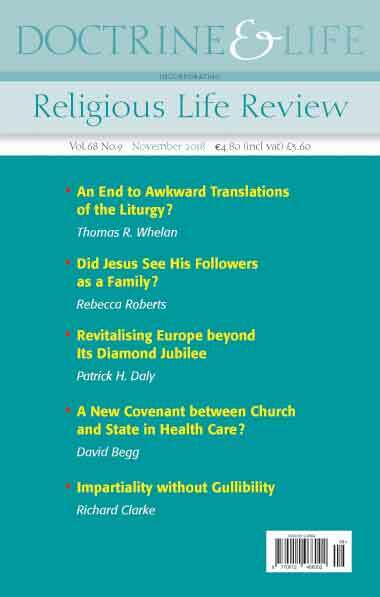 Please find below some of the articles in the November 2018 edition of Doctrine & Life. An End to Awkward Translations of the Liturgy? Thomas R. Whelan surveys the battles surrounding the translation of the Mass into a style of English suitable for public proclamation. While commenting on Lost in Translation: The English Language and the Catholic Mass, by Gerald O’Collins with John Wilkins, he points to the ways by which, during previous papacies, Rome took control of the translation process. He recognises that Pope Francis is now providing for the exercise of authority in the matter where it belongs, with local conferences of bishops. Did Jesus See His Followers as a Family? Rebecca Roberts examines the passages in Mark where Jesus calls his followers away from their own families and defines his kin group with a new set of values. Patrick H. Daly describes a dialogue encounter held in Rome at the end of 2017, to mark the sixtieth anniversary of the Treaty of Rome. He addresses problems now facing the European Union and points to ways in which the Church could put wind in the EU’s sails, recognising, with Pope Francis, that dialogue is a fundamental responsibility of politics. Can We Have God without Heaven? Martin Henry suggests that God honours us, as it were, by letting the apparent, humble ordinariness of our lives become a fundamental ingredient in the reality of the glory of heaven. A New Dialogue between Church and State in Health Care? David Begg continues his series on ‘Justice Questions’. Archbishop Richard Clarke surveys themes in the writings of Elizabeth Bowen, especially her pointing to an innate and almost certainly unintended cruelty within innocence. Ian Linden reflects on the canonization of Oscar Romero and on the actions both of his followers and of his detractors that delayed that proclamation. John Scally is reminded in November of the death of his cousin Oliver, and of how suffering, particularly after the death of a loved one often appears an unanswerable conundrum for those who believe in the Christian God and it often rouses us to anger. 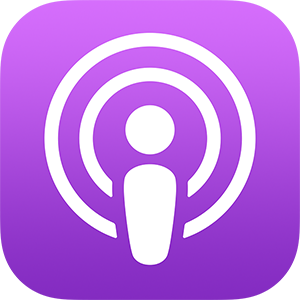 What Makes the Gospel of John Special? Amanda Dillon reviews The Sign: Reading the Gospel of John, by Seán Goan. The start of the Fatima Novena in St. Mary’s Church, Popes Quay in Cork, was marked with a Rosary Rally last Saturday. There was a great turnout and all processed from the Grand Parade to St Mary’s church with the statue of Our Lady. Bro Jesse Maingot OP preached at the Mass which followed to open the Novena. The Fatima Novena runs daily in St Mary’s until coming Sunday the 7th if October. Please find some picture of the event below. Fr. Hugh Fenning OP passed away on Wednesday the 25th of July 2018. Colmán Ó Clabaigh OSB kindly sent the following message to the province which we share to recognistion the attribution of all the work Fr Hugh has done over the years. I’have just now learned of Dr Hugh Fenning’s death. As I am unable to get to the funeral I wanted to let you know, as his confreres, that I am praying for him and that he was remembered at the Conventual Mass in Glenstal today. He was a larger than life character and one who was enormously supportive of my research for The Friaris in Ireland 1224-1540. I greatly valued his combination of erudition, criticism, kindness and occasionally acerbic wit. He made many contributions to the history of Irish Catholicism and of the Order of Preachers. I think particularly of his edition of Benedict O’Sullivan’s Medieval Irish Dominican Studies for which he painstakingly tracked down every source and reference that O’Sullivan used but never cited. This was very much labour of love for him and along with his own publications will long be the standard reference works for Irish Dominican history. Dr Bernadette Williams has also asked me to convey her sympathies to you. 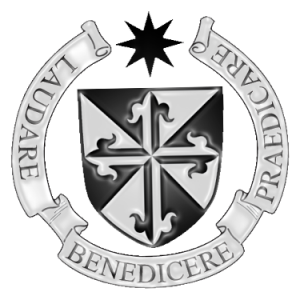 She too corresponded with Fr Hugh in preparing her edition of the chronicle of the 14th-century Dublin Dominican, Friar John Pembridge. Like you I feel his loss keenly and pray that he now joins the chorus of those who he researched so diligently in singing the Salve Regina and O Lumen Ecclesiae at the Wedding Banquet of the Lamb. “What happened in 1968?”, a talk of the Ratzinger Symposium given by Prof. Tracey Rowland member of the International Theological Commission. The Ratzinger Symposium met on Saturday 9th of June 2018 in Saint Saviours Priory in Dublin from 11am to 1pm. Today, the last day of Mary’s month, we celebrate the Visitation of Our Blessed Lady to St Elizabeth. On the occasion of this meeting between the two cousins, both women were with child. Our Holy Mother carried the Divine Lord within her womb and St Elizabeth was pregnant with St John the Baptist. The famous meeting is depicted in this stained glass window at St Saviour’s on Dominick Street. As it is the last day of May, today presents a fine opportunity to greet Our Blessed Lady by making a visit to a grotto or any of her shrines in a church near you. She is always eager to hear our prayers. Given that today’s feast also celebrates the meeting of Our Lord and St John the Baptist, both of whom were in their mother’s wombs, let us pray especially that with Holy Mary’s maternal protection we will continue to defend the life of unborn children until we have gained final victory over the forces of evil.